This approximately 60-foot-high arroyo wall failed on March 12, 2005, creating an earth-fall landslide that buried one child and partially buried two others. Alternating layers of sand, silty sand, and silty clay comprise the majority of the stream cut. At about 5:30 p.m. on Saturday, March 12, 2005, a vertical stream cut along Kanab Creek collapsed in an earth-fall-type landslide, burying a 10-year-old boy and partially burying two girls. The girls, one covered by landslide material to her waist and one to her knees, were able to free themselves and began searching for the boy, but were forced to flee when a second section of the stream cut collapsed. The landslide involved about a 100-foot-long portion of the approximately 60-foot-high vertical stream cut on the west side of Kanab Creek within the city limits of Kanab. The landslide resulted in a pile of material at the base of the cut which, according to Tom Cram, Kanab City Police Chief, was up to 20 feet thick. Workers using heavy equipment took 15 hours to recover the boy’s body. 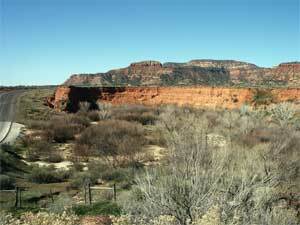 A typical semi-arid southwestern U.S. arroyo (downcut gully with vertical walls in unconsolidated sediment), Kanab Creek deeply incised its channel during a series of major flood events beginning in the early 1880s. Prior to that time, the creek was described as a “shallow braided stream” that meandered across a broad, nearly flat meadow formed where the stream exited the Vermillion Cliffs to the north. 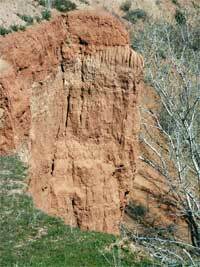 Currently the high arroyo walls of Kanab Creek range from vertical where the stream is close to the base of the wall and erosion is active, to near the angle of repose for sandy material (about 40° or less) where the stream is more distant and material has accumulated at the base of the arroyo wall. Cottonwood and willow trees line the sides of the active stream channel in the arroyo bottom, and sagebrush and grasses grow on the arroyo walls were slopes permit. 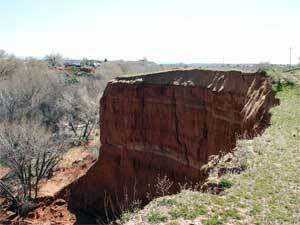 Although within a few tens of feet of the failed arroyo wall, Kanab Creek was not at or currently eroding the base of the wall where the landslide occurred. 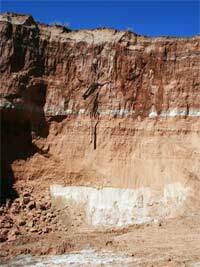 Geologic materials exposed in the arroyo wall where the landslide occurred consist chiefly of alternating layers of medium- to thick-bedded red sand, silty sand, and silty clay with discontinuous, thin interbeds of well-sorted white sand, gray silty clay, and gravel and cobbles. These materials were deposited by Kanab Creek, and were derived chiefly from Mesozoic sedimentary rocks (sandstone, siltstone, and claystone) that crop out in the Kanab Creek drainage basin. A few feet of loose, medium brown eolian (windblown) sand caps the cut. Deep, vertical cracks spaced several feet apart and generally parallel to the face of the vertical arroyo wall were observed where the landslide occurred. While visible only in one place along the top of the cut where additional failure is imminent, several cracks were visible both where the landslide occurred and in adjacent areas. 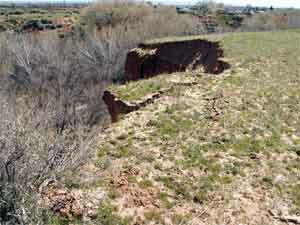 The section of arroyo wall that failed in the landslide detached under the force of gravity along one or more of these cracks and fell to the stream bottom below. Like much of southwestern Utah, the Kanab area has experienced greater than average precipitation, mostly in the form of rain, this winter. However, only the upper few feet of material exposed in the stream cut were moist; the deeper materials comprising most of the arroyo wall were dry. 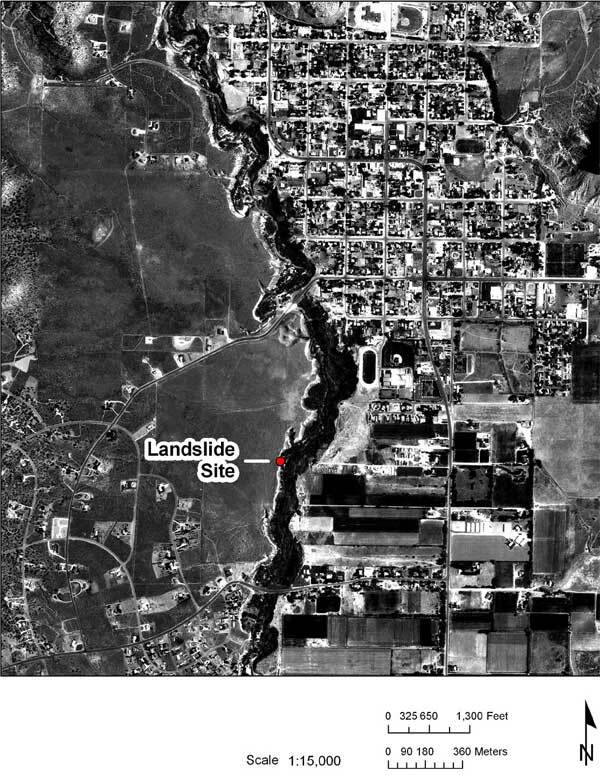 The additional water weight in the upper few feet of the arroyo wall may have contributed in a small way to the landslide, but the failure essentially occurred under dry conditions and is more likely the result of the long-term effect of gravity acting on the unconsolidated material in the vertical wall. This report is preliminary (3/23/05) and subject to revision; it is presented here to facilitate a release of pertinent, timely information.